Mauna Kea Observatories located at the summit of Mount Mauna Kea, 4200 meters high in Hawaii Island, Hawaii, U. S. A., is a particularly advantageous site for astronomical observations. Since many clear nights are available, the sky is very dark and air turbulence causing so-called scintillation is weak. 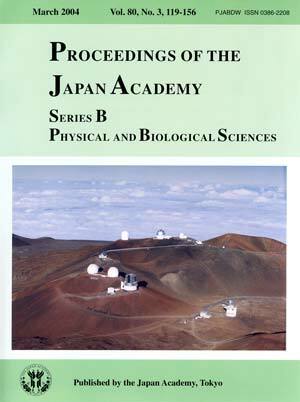 A total of 12 sets of telescopes from various countries are included in the complex, one being the Subaru optical-infrared telescope of 8.2 meters diameter operated by National Astronomical Observatory, Japan. It is pictured at the center of the photograph. 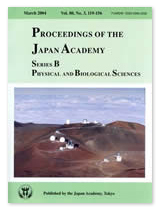 The enclosure of the Subaru telescope is not any type of conventional dome because Japanese Astronomers believe that the actual structure chosen can reduce air turbulence. In fact the telescope has proven to produce very sharp images of stars and galaxies, facilitating detection and exploration wide variety of novel phenomena in the universe, such as galaxy formation occurring in the most distant regions more than ten million light years away, planetary systems orbiting around nearby stars and icy small bodies moving at the furthest edge of the solar system. Actually the most distant galaxy was found using the Subaru telescope. Use is open to astronomers from all parts of the world although there is severe competition to obtain telescope time. Written by Yoshihide Kozai, M. J. A.